Svitlana is here again sharing today three masculine cards that can be made with supplies that are not masculine specific. The first two cards are extremely simple, easy and quick to make. To start off I took a white card base and masked almost all part of it leaving like 3/4 of inch from the bottom unmasked. I stamped the New York cityscape from the bottom. Next I turned the card base upside down, masked the part where I already had stamping and stamped the cityscape upside down. I used Desert Night ink for stamping. Finally I added a sentiment from Trophy Life set and several wood stars. The third card is my favorite. It’s more time-consuming then the first two, but is totally worth it. I love creating realistic wood look on my cards and for this one I was going for a wooden background and wood veneer embellishments. I started by clear embossing a sentiment from Wood Pallet Background set on a kraft panel. Next I stamped the wood planks design from the same set in Dark Chocolate ink and inked the panel with Distress Vintage Photo ink and removed ink excess from the embossed sentiment after finished inking. 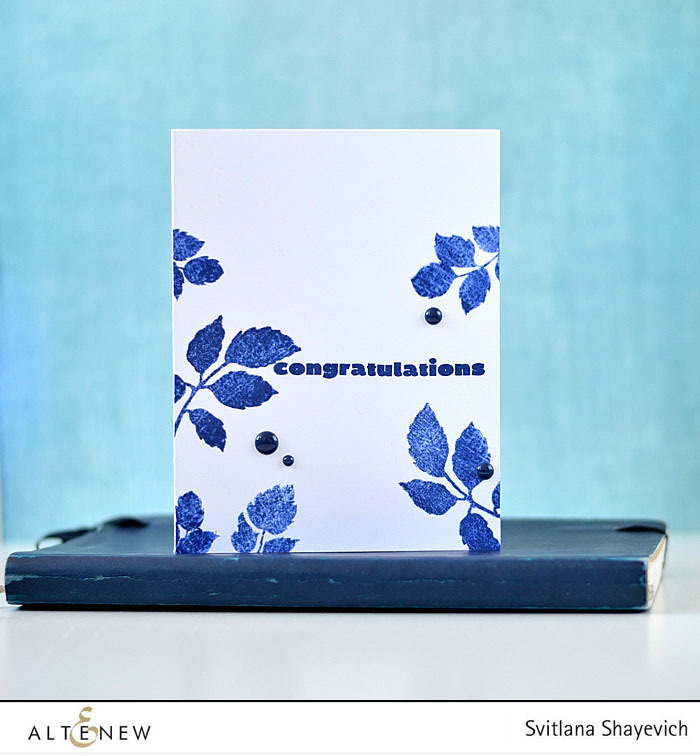 Next I stamped a couple of leaves branches from Beautiful Day set using Dark Chocolate ink. I wanted stamp impressions to be more intense, so I double stamped each branch using my MISTI tool. I die-cut branches from the panel using die from Beautiful Day dies set, along with die-cutting parts for my wood veneers. I cut the same shape for each branch 5 times from kraft cardstock and twice from brown one (so there were 10 kraft die-cut and 4 brown altogether). And then I adhered them together creating a faux wood veneer (I put brown die-cuts in the middle of kraft ones). To get my sentiment “carved in wood” look – I ironed off embossing from it. Finally I assembled my card by adhering the panel to a kraft card base, adhering “wood veneers” in their negatice space and adding several wooden dots (there were real wood). I made a video showing this simple technique. 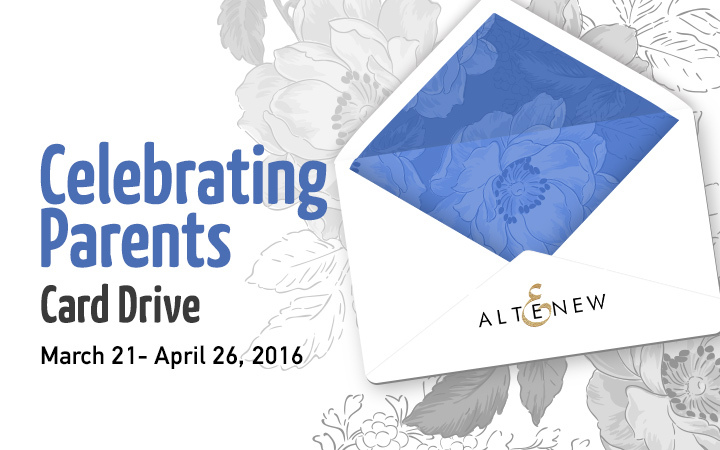 Again, these were made for Altenew Celebrating Parents Card Drive. We all still have time to send out cards for this drive. Wow! These cards are all beautiful but the “Wooden Card” is absolutely stunning!!!! Love it! I’m agree with Arianna, wooden card is amazing! Love how you used only a portion of the sketchy cities. 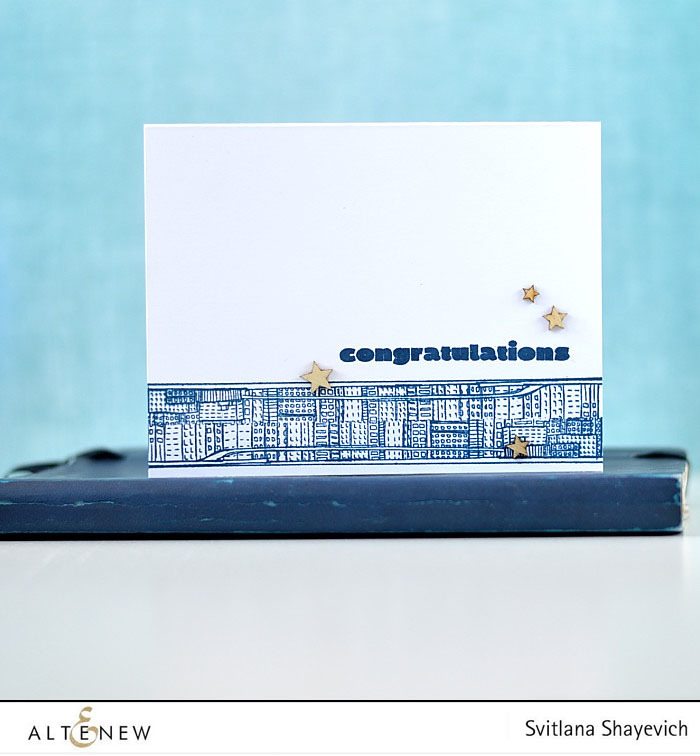 Thinking outside the box on how to stretch your stamps. I LOVE the wood card. Can’t wait to try this with what I have. Oh, you are such a clever girl! These are wonderful ideas for men’s cards! I especially like the industrial look of the first card. Svitlana all three are just fantastic … LOve what you’ve done with the Sketchy Cities both for the border, and the kissing technique!!! WOW! Love the wood veneer technique. So great for masculine cards. TFS the video. Thank you! I hope my video was helpful! Awesome masculine cards and great ideas to tweak a bit for variety. Your woodgrain one is my favorite of the three, but your city scapes one is also very, very clever! such a clever use of the stamps! What gorgeous cards! Love that woodgrain one especially and all of the great dimension you added to it! Thank you, Celeste! I’m glad you liked them! 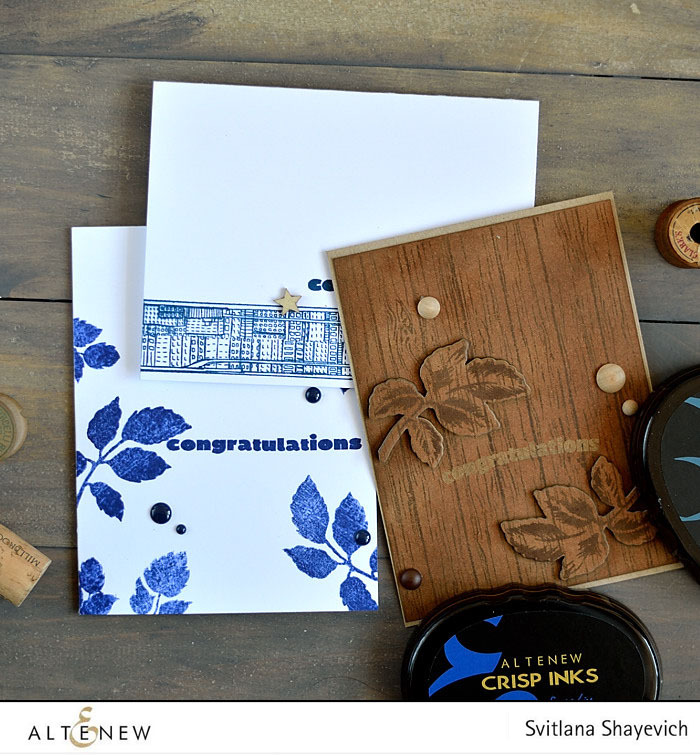 fabulous cards Svetlana, and thank you for the video showing how you made the brilliant “wooden” card – YaY!!! Thank you, Janet for your sweet words! Wonderful cards! Thanks for the video, love the “wooden” pieces. Fabulous, needed that video. Thank you. So glad to read this! Thank you, Janet! Ingenious Svetlana! I love them all but WOW for the woodgrain card! I am so amazed at how you think out of the box and create something so incredible. Thank you for your creations. Thank you, Deborah! You’re so sweet! Cool masculine cards! The faux woodgrain and wood veneer card is amazing! Thank you, Cris! So glad you liked them!